Distribution: Foraminifera are found in all marine environments, from the intertidal to the deepest ocean trenches, and from the tropics to the poles, but species of foraminifera can be very particular about the environment where they live. Some are abundant only in the deep ocean, others are found only in brackish estuaries or salt marshes along the shore, and most live at certain depths and water temperatures in between. Most of the estimated 4,000 living species of forams live in the world's oceans. Of these, 40 species are planktonic, that is they float in the water. The remaining species live on the bottom of the ocean, on shells, rock and seaweeds or in the sand and mud of the bottom. 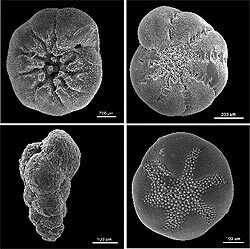 Description: The Foraminifera, ("Hole Bearers") or forams for short, are single-celled protists with shells which can have either one or multiple chambers, some becoming quite elaborate in structure. Depending on the species, the shell may be made of organic compounds, sand grains and other particles cemented together, or crystalline calcite. They are usually less than 1 mm in size, but some are much larger, and the largest recorded specimen reached 19 cm. Interesting facts The shell or “test” have been found as far back as the Cambrian period, and many marine sediments are composed primarily of them. For instance, the limestone that makes up the pyramids of Egypt is composed almost entirely of benthic foraminifera. Production estimates indicate that reef foraminifera annually generate approximately 43 million tons of calcium carbonate and thus play an essential role in the production of reef carbonates. Dying planktonic foraminifera continuously rain down on the sea floor in vast numbers, their mineralized tests preserved as fossils in the accumulating sediment. International Ocean Drilling Programmes, for oil exploration, have been bringing up sediment cores bearing foraminifera fossils by the millions. The oil industry relies heavily on microfossils such as forams to find potential oil deposits. Geographic patterns seen in the fossil records of planktonic forams are also used to reconstruct ancient ocean currents. This data has helped us understand how climate has changed in the past and thus how it may change in the future. Because certain types of foraminifera are found only in certain environments, they can be used to figure out the kind of environment under which ancient marine sediments were deposited. Status: Because calcium carbonate is susceptible to dissolution in acidic conditions, foraminifera may be particularly affected by changing climate and ocean acidification.